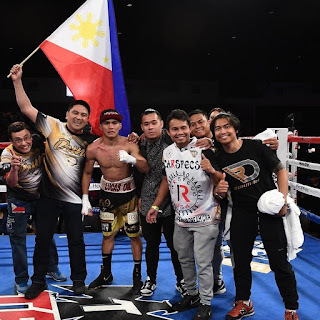 Press Release: May 18, 2018 By Sanman Promotions – Romero “Ruthless” Duno continued to impress, sustaining his hot streak with a convincing unanimous decision win over Mexico’s Gilberto Gonzales Friday noon (PH time) (Thursday night in the United States) at the Fantasy Springs Resort and Casino in Indio, California. All three judges scored the bout for Duno, 97-93, 97-93 and 98-92. It was Duno’s eighth straight win as he came up with another solid showing in the United States and hiked his record to 17W-1L-0D, 14KOs). “I hope I gave the fans a great fight. Gonzales is very tough and a good boxer,” said Duno. With the impressive, Duno expressed readiness for tougher tests ahead. “I am ready for big fights,” said Duno, who dealt Gonzales his fifth loss to go with 26 wins, 22 by knockouts. Duno dominated the contest from the get go, peppering the Mexican fighter with solid combinations. Gonzales fell in the second round but the referee ruled it a slip. Gonzales fell in the second round but the referee ruled it a slip. A clash of heads resulted to a cut above Gonzales’ right eye. Despite being bloodied, Gonzales still put up a tough stand but Duno didn’t taper off en route to tallying the huge win. The fight was the main event of a card promoted by Golden Boy Promotions.